This has been the hardest episode to record, so far. Sometimes, I feel like I’ve been reading and learning about disasters for so long that I’ve become desensitised to tragedy, but that’s definitely not the case. I look for primary sources; the words of those who actually experienced the events I’m talking about, and it always brings it home for me. However, this is the first time that I’ve covered a fatal incident that I actually remember happening. I was ten years old at the time; the same age as the youngest victim. Add to that the fact that I now live in the North; I’ve spent time in Liverpool, I have friends there. It all makes it feel a little closer than usual. And then, of course, there’s the fact that this disaster was caught on film. I watched the footage from that day to prepare this episode, and afterwards I needed to go and hug my loved ones. It doesn’t matter that I’d seen it before, it’s still heart-breaking to watch, and it always will be. It’s also heart-breaking to know that, even though it happened nearly 29 years ago, I still can’t tell the whole story, as there are prosecutions outstanding. The families have waited a long time for justice, and until those cases are resolved, we can’t say that it’s over, we can’t say that all the lessons have been learned. 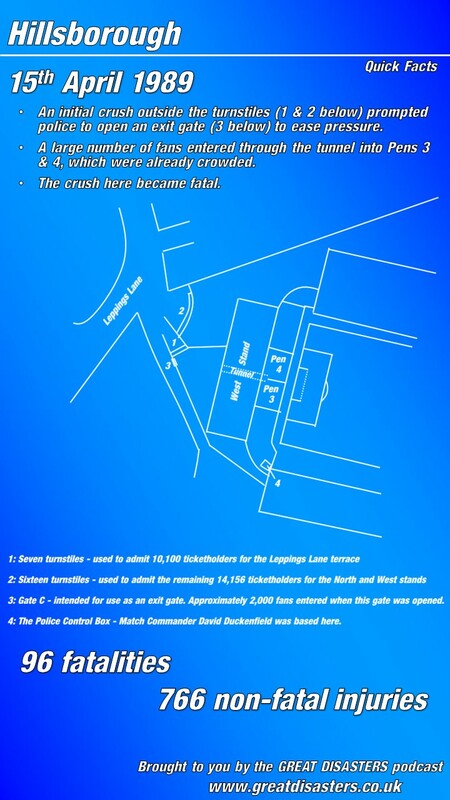 The most comprehensive source for this event is the archive of disclosed material and reports from the Hillsborough Independent Panel. The Hillsborough Family Support Group is on Facebook and Twitter. The BBC co-produced a documentary, called “Hillsborough”, with ESPN, produced and directed by Daniel Gordon. It was first aired in 2014, and an extended version was shown in 2016 following the inquest and final verdict. 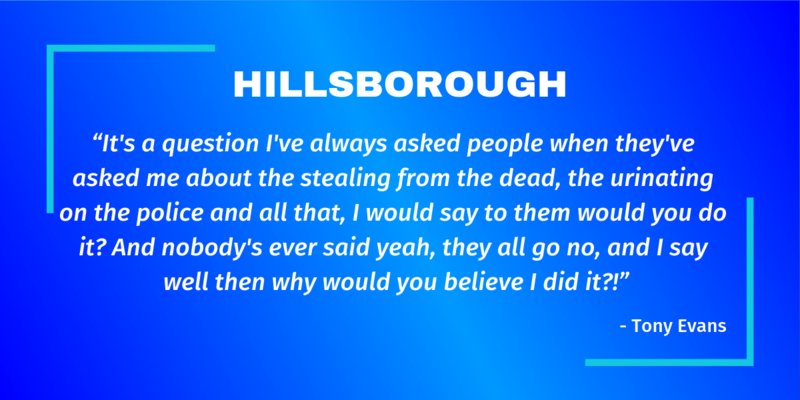 I also referred to the first-hand accounts given in the book “Hillsborough Voices”, by Kevin Sampson.